This was likely made in Occupied Japan around the 1940s/50s. Japan Toy Doll Dollhouse Serving Dish. 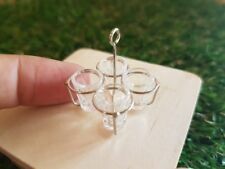 Miniature TEA SET TRAY Porcelain Floral. I believe it is from the 1940s or so. Miniature ALPACA STERLING SILVER TURQUOISE TEA SET. 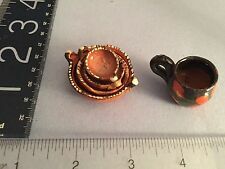 Dollhouse Artisan Dish Lot. COPPER/BRASS COLOR COOKWARE. DOLLHOUSE MINIATURE. I NOTE ANY FLAWS I MIGHT FIND AND TRY NOT TO MISS ANY. MOST STUFF IS EITHER NEW OR GENTLY USED AS NOTED. MAYBE SOAKING THE GLUE OFF WILL WORK. I DO MY BEST TO TAKE MANY PICTURES SO YOU CAN SEE WHAT YOU ARE BUYING. These are lovely and very well made. Circa 1960's. Adorable serving plates all can be stacked together so beautifully and lovely painted cup. Materials: Porcelain Dimension: Cup height 10 mm (0.39") Saucer diameter 21 mm (0.82") Teapot height 29 mm (1.14") Pot w/lid height 20 mm (0.78") Milk Cup height 16 mm (0.63") Applicable for 1:10 1:12 dollhouse Package Included: 6 x saucers, 6 x cups, 1 x teapot, 1 x pot w/lid, 1 x milk cup. Note:Please note this item is not full size, it / they are for a dolls house and miniature collectors. Materials: Porcelain Features: Yellow Color with Flower Pattern Dimension Approx: Dish: 16 x 16 mm (0.63" x 0.63") Cup: Height 10 mm (0.39") Teapot w/Lid: Height 30 mm (1.18") Suger Pot w/Lid: Height 19 mm (0.75") Milk Cup: Height 13 mm (0.51") Tray:50 x 50 mm (1.96" x 1.96") Applicable to 1:10 doll house or Bjd scene Package Included: 2 dishes, 2 cups, 1 sugar pot,1 milk cup,1 tea pot,1 Tray. (other items NOT included) Warning: Not edible, keep it away from infants. Note:Please note this item is not full size, it / they are for a dolls house and miniature collectors. If you satisfy with our products and services. Color : Clear white. 100% Guaruntee. Quantity : 5 pcs/set. Size : width 2x2 cm,length 2.5 cm (Approx). Materials: Porcelain Features: White Color with Rose Flower Pattern Dimension Approx: Dish: 21 x 21 mm (0.83" x 0.83") Cup: Height 10 mm (0.39") Teapot w/Lid: Height 30 mm (1.18") Suger Pot w/Lid: Height 22 mm (0.86") Milk Cup: Height 16 mm (0.62") Tray:62 x 62 mm (2.44" x 2.44") Applicable to 1:10 doll house or Bjd scene Package Included: 2 dishes, 2 cups, 1 sugar pot,1 milk cup,1 tea pot,1 Tray. (other items NOT included) Warning: Not edible, keep it away from infants. Note:Please note this item is not full size, it / they are for a dolls house and miniature collectors. Materials: Porcelain Features: with leaf/ flower patterns Dimension: Big Round Plate: 25x25 mm (0.98"x0.98") Small Round Plate: 21x21 mm (0.82"x0.82") Big oval serving Plate: 45 x 23 mm (1.77" x 0.9") Small oval serving Plate: 30 x 23 mm (1.18" x 0.9") Cup: height 10mm (0.39") Pot : 37x30x25 mm (1.45"x1.18"x 0.98") Applicable to 1:10 dollhouse or Blythe scene Package Included: 4 big round plates, 4 small round plates, 1 big oval serving Plate, 1 small oval serving Plate, 4 cups, 1 pot ,1 gravy boat, 1 spoon. Note:Please note this item is not full size, it / they are for a dolls house and miniature collectors. Approximate size of cup is 3/8" x 3/8" x 3/8", width, length, and height respectively. Oval Tray is 1" x 1 5/8", width and length. There are mostly coming from estate sales. Materials: Porcelain Features: Pink Color with Flower Pattern Dimension Approx: Dish: 16 x 16 mm (0.63" x 0.63") Cup: Height 10 mm (0.39") Teapot w/Lid: Height 30 mm (1.18") Suger Pot w/Lid: Height 19 mm (0.75") Milk Cup: Height 13 mm (0.51") Tray:50 x 50 mm (1.96" x 1.96") Applicable to 1:10 doll house or Bjd scene Package Included: 2 dishes, 2 cups, 1 sugar pot,1 milk cup,1 tea pot,1 Tray. (other items NOT included) Warning: Not edible, keep it away from infants. Note:Please note this item is not full size, it / they are for a dolls house and miniature collectors. Materials: Porcelain Features: White color with yellow flower pattern Dimension Approx: Plate: dia.67 mm / 2.6" Saucer: dia.21 mm / 0.82" Cup: Height 14 mm / 0.55" Milk Cup: Height 18 mm / 0.7" Pot with two ears: Height 26 mm / 1.0" Teapot w/Lid: Height 46 mm / 1.80" Applicable to 1:6 doll house or Bjd scene Package Included: 1 plate, 2 cups, 2 saucers, 1 pot w/two ears,1 milk cup,1 tea pot. Warning: Not edible, keep it away from infants. Note:Please note this item is not full size, it / they are for a dolls house and miniature collectors. Materials: Porcelain Features: White color with strawberry pattern Dimension Approx: Plate: dia.67 mm / 2.6" Saucer: dia.21 mm / 0.82" Cup: Height 14 mm / 0.55" Milk Cup: Height 18 mm / 0.7" Pot with two ears: Height 26 mm / 1.0" Teapot w/Lid: Height 46 mm / 1.80" Applicable to 1:6 doll house or Bjd scene Package Included: 1 plate, 2 cups, 2 saucers, 1 pot w/two ears,1 milk cup,1 tea pot. Warning: Not edible, keep it away from infants. Note:Please note this item is not full size, it / they are for a dolls house and miniature collectors. Materials: Porcelain Features: White color with red rose pattern Dimension Approx: Plate: dia.67 mm / 2.6" Saucer: dia.21 mm / 0.82" Cup: Height 14 mm / 0.55" Milk Cup: Height 18 mm / 0.7" Pot with two ears: Height 26 mm / 1.0" Teapot w/Lid: Height 46 mm / 1.80" Applicable to 1:6 doll house or Bjd scene Package Included: 1 plate, 2 cups, 2 saucers, 1 pot w/two ears,1 milk cup,1 tea pot. Warning: Not edible, keep it away from infants. Note:Please note this item is not full size, it / they are for a dolls house and miniature collectors.